The updates are pouring in - check to see if your phone is included. It's been a while since Android Lollipop was unveiled, but a lot of your handsets still don't have it, as it's down to individual manufacturers to bring it to their devices. That takes time, but we're seeing it trickle out to ever more phones, and many manufacturers have also revealed when they plan to roll out the update. We're constantly updating this article as new information emerges so read on for details about your specific device and manufacturer and remember to check back regularly. The good news though is that if you don't have Lollipop for your phone yet you probably will soon. And the even better news: it's worth the wait, as it includes a smörgåsbord of new features, a visual overhaul and numerous under-the-hood improvements to make it faster, more efficient and lighter on your battery. Latest update: The Android 5.1.1 Lollipop update is now available for the Sony Xperia T2 Ultra Dual and the Samsung Galaxy Grand Prime. One of the best things about buying a Nexus device is that they're first in line for software updates. As such not only did the Nexus 6 and Nexus 9 ship with Android 5.0 Lollipop, but it's since been rolled out to the Nexus 5, Nexus 4, Nexus 7 Wi-Fi (both the 2012 and 2013 versions) and the Nexus 10. That's most of the remotely recent Nexus devices accounted for, but it does leave a big question mark against the cellular versions of the Nexus 7 2012 and 2013. Those tablets should see an update at some time, though Google has not indicated when this will be. Any Nexus devices older than the ones we've already mentioned are all but guaranteed not to get it, meaning that Nexus S owners are plum out of luck. 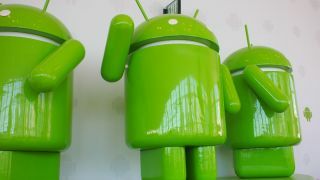 Google has also confirmed that the Galaxy Nexus will not receive the update. The HTC One M8 should be receiving an Android 5.1 update with HTC's Sense 7 UI in August, according to TalkAndroid. The HTC One M9 update was also included in the speculation as another device that will be getting upgraded around the same time. It's now been revealed that European owners of the HTC One M9 will get the OTA (over the air) update to Android 5.1 at the beginning of August. Not only with the HTC One M9 benefit from the host of bug fixes that Google included with Android 5.1, but it will also make the handset charge faster. The Android 5.1.1 Lollipop update, which comes with a few more fixes, is now also making its way to the HTC One M9, so checking your Settings to see if the update is ready for your device. As for older handsets waiting for Android 5.0, the Google Play Edition of the HTC One M7 has got the update, while unlocked and developer versions of the HTC One M8 worldwide and the HTC One M7 in the US have now been given a lick of Lollipop too. But owners who have a device that's tied to a specific mobile network or those with a One M7 outside the US may have to hold on for a little while longer. We're going to assume that most other HTC handsets released in the last 12-18 months will also get Lollipop at some point given HTC's commitment to the upgrade cause. As a general rule the more recent and high profile a device is the more likely it is to get an update. Indeed according to LlabTooFeR the HTC Desire Eye and HTC One E8 will both get updated. Another leak states the HTC One Mini 2 and Desire 816 will get Lollipop sometime in March or April, while the HTC One Max, HTC One Mini and Butterfly S have an expected Android 5.0 rollout of March-May. The Samsung Galaxy S6 and Galaxy S6 Edge both came with Android 5.0 Lollipop installed, but Samsung is now in the process of rolling out an update to the latest version, Android Lollipop 5.1.1. Owners of unlocked Galaxy Note 4s are now able to get the update by connecting to a Wi-Fi network, opening up Settings, selecting 'About Device' and tapping on 'Update Now' under the Software Update option. The Android Lollipop 5.1.1 update is now rolling out to international versions of the Galaxy Note 4, so check your device to see if there is a new download waiting for you to install. Samsung started rolling out Android 5.0 to the Galaxy S5 in mid-January, so most if not all S5 handsets should have it by now. The Android 5.0 update for Samsung's Galaxy S4 handset is now live for owners in India, so we should expect S4 smartphones in other parts of the world to get the update soon. You'll be able to download the 1GB update OTA (over the air) or through the Samsung Kies desktop software. Russian users of the Galaxy S4 should also be able to grab the update, while various European countries are seeing the update land on the Galaxy S4 LTE-A. The Samsung Galaxy Grand Prime is also getting an update to Android 5.0 Lollipop in Russia, with handsets in other countries getting it soon after. In fact, owners of the Galaxy Grand Prime in the US can now get the Android 5.1.1 update. The Samsung Galaxy Note Edge should have the update to Android 5.0 Lollipop by now, with it heading to lucky owners in Australia first. The update will be 1.02GB large, so make sure you're on Wi-Fi when you download, and Samsung notes you'll need 3GB of free space. The update to Android 5.1.1 Lollipop is now being rolled out to the Galaxy Note Edge in the US. If you're on Sprint, Verizon, T-Mobile and AT&T then you should be getting the Android 5.1.1 Lollipop soon, though no exact date has been given. Note Edge owners outside of the US (or on other networks) should get the update soon as well. It's also now started rolling out to the Galaxy Note 3 already according to SamMobile, and Samsung has just announced on Twitter that the Galaxy Note 3 Neo will be getting the Lollipop update soon. Samsung France has also announced that unlocked Galaxy Alpha handsets in Europe will now be getting the Android 5.1.1 Lollipop update in July. Network operators will also get the update, but it might take some time before they begin rolling it out to Galaxy Alphas that are locked to their service. Other Samsung handsets may have to wait a little longer, although we'd expect that most high profile devices released in the last 18 months to two years will get the update, including the Galaxy S5 Mini. Earlier in the year it was confirmed by UK network Three that the Galaxy S4 Mini would not be getting Android 5.0 Lollipop due to memory limitations of the device. Samsung UK has since confirmed on Twitter that the Galaxy Ace 4 will not be getting the Android Lollipop update either. Samsung has now confirmed those in the UK will not see an update to Lollipop on the Galaxy Note 2 or the Galaxy S3. It isn't currently clear why the Lollipop software won't be coming to handsets as those in Denmark and Poland are soon to receive the update but we've asked Samsung and hope to hear back soon. Owners of Samsung's distinctive Galaxy K Zoom handset, which features a 20.7MP rear camera and 10x optical zoom, are also out of luck with the official Samsung Mobile UK Twitter account confirming that the device will not be getting an update to Android 5.0 Lollipop. Samsung doesn't seem great at updating its tablets either. There's a good chance recent slates like its Note Pro and Tab S ranges and even the Samsung Galaxy Note 10.1 2014 will get Android Lollipop, but anything older or low end is probably not going to happen. Sony has openly declared that it will be "bringing Android 5.0 Lollipop to the entire Xperia Z Series." It's even published a full list of handsets that are in line for Android Lollipop, and the Sony Xperia Z Ultra Google Play Edition has already received the update. Sony started rolling out the Android 5.0 Lollipop upgrade for the Xperia Z3 and the Xperia Z3 Compact on March 16. Owners in the Nordics and Baltics regions will be the first to see the update, with other markets getting it soon after. Sony also announced that the rest of the Xperia Z series will get the update, and sure enough a new blog post on April 16 claimed that the Xperia Z3 Dual, Xperia Z1, Xperia Z1 Compact and Xperia Z Ultra will be getting Android 5.0 Lollipop in the next few days. The Xperia T2 Ultra and Xperia C3 are scheduled to follow in a few more weeks, with Xperia devices from 2013, including Xperia Z, Xperia ZL, Xperia ZR and the Xperia Tablet Z, also due for an upgrade sometime in the future. Sony has also brought the Android Lollipop 5.1.1 update to the Xperia T2 Ultra Dual as an OTA (over the air) update and is being rolled out in stages, but if you're impatient you can upgrade manually by opening Settings and tapping "About Device", select "System Updates" and then tap on "Check for updates".